The year 1863 dawned with the town free of warring troops. The war had moved south, and the two great armies were encamped around Fredericksburg. Local cavalry companies, both Union and Confederate, paid but frequent visits to Waterford during the winter. Colonel E. V. White's 35th Battalion Virginia Cavalry was brigaded with Brig. Gen. W. E. Jones' command preparatory to his campaign in Western Virginia. The Loudoun Rangers were camped at Point of Rocks, Maryland with little to do, as there was no activity 109 the border on the part of the Confederates. Life in Waterford was nearly normal, true, the stores had only limited stocks merchandise, and the mill was dosed. With the exception of the shortage of 'plies and the absence of many young men the community again appeared at peace. Confederate money had not made its appearance in the community. Some Virginia State currency was used, but at only sixty per cent of its face value; United States Currency was still the medium of exchange although the town was longer a part of the Union. It became increasingly difficult for the Confederate soldiers who enlisted from Waterford to send enough money home to supply the needs of their families. Many deeds of kindness were shown toward these families by the Union sympathizers, especially by the Quakers. Despite the difference in political opinions, they were fellow townsmen and neighbors. Waterford was by-passed as the armies moved north for the Pennsylvania campaign. Only a few regiments of cavalry came through the town headed for the river crossings. Following the great battle at Gettysburg, the town sprang to life as the Union army marched south again. 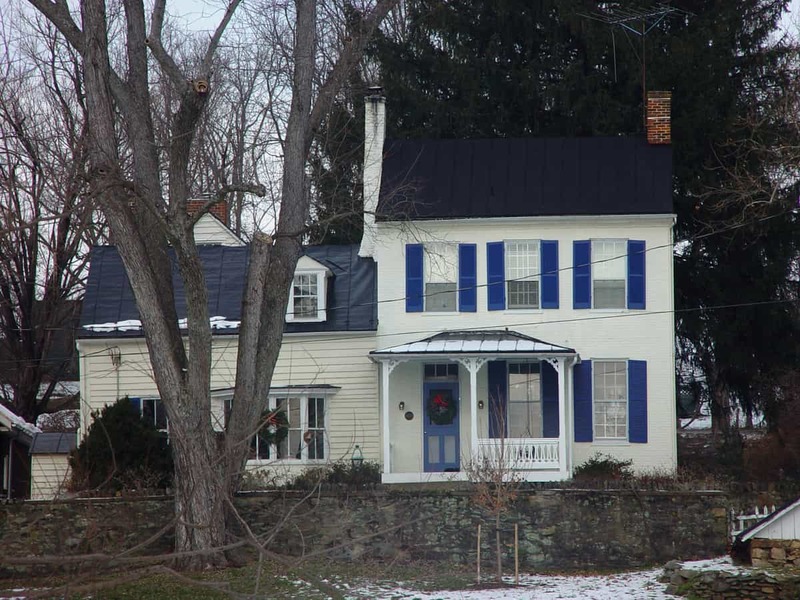 The First Army Corps, after crossing the Potomac at Berlin (Brunswick), moved on to Waterford on July 18th, to camp along the banks of the Catoctin Creek. The Union citizens turned out to welcome the troops as the Third Division marched through the town. The 150th Pennsylvania Infantry had their drum and fife corps at the head of the column, but only the sound of the fifes could be heard as their drums and knapsacks had been lost on the first day at Gettysburg. As the Third Division cleared the village, to camp just south of the town, they were closely followed by the First Division who camped around the town. Flags were hung from the houses along the route of march, while cool water and cookies were handed to the hot, dusty soldiers as they passed. It was surprising to the Federal soldiers to see so much Union sentiment in a seceded state, and many contemporary accounts have survived. The 24th Michigan Infantry, of the famous "Iron Brigade" who had won undying fame on McPherson's Ridge at Gettysburg, were in a particularly gay mood, and recorded the following in their history: "Through a fair region not before ravaged by the war, the column passed on to Milltown, and bivouacked nine miles from Berlin, at Waterford, a most beautifully embowered and intensely loyal village. It seemed strange to find so patriotic a place in the Confederate dominions, and that evening merry maidens of the place with elastic step, tripped the fantastic toe with the Army officers. The streets were filled with matrons, maidens and children, who waved handkerchiefs and the starry Bag and cheered on the Union troops with many a hurrah for the Union. God bless Waterford." Early on Sunday morning, July 19th, the Second Division passed through the town, and the hilarity of the night before had not dampened the enthusiasm of the townspeople for their heroes. 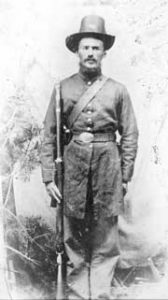 A member of the 39th Massachusetts Infantry wrote the following home: "We passed through Waterford this morning, which is a right smart place of about 600 inhabitants. They are mostly Union in that vicinity, several houses had its Union flag hung out and the women stood at the doors with water to give to the soldiers. There was several hundred Union soldiers enlisted there. They do not take Reb. Scrip." War has its horrors, but it can also have its brighter moments, and Waterford was to have its soldier romances. 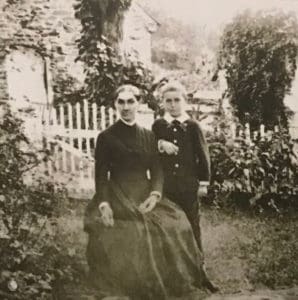 Sometime previously a hot dusty trooper of the 5th New York Cavalry had stopped in the town for a drink of water and found a charming young lady who became his bride after the war. 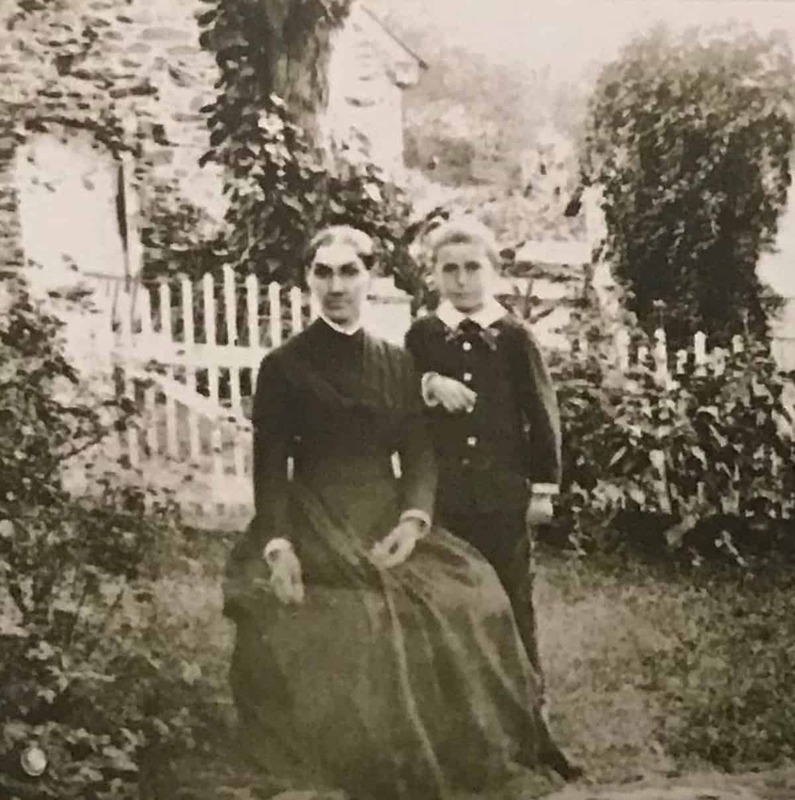 Now it was her sister's turn to find romance amidst the shambles of war: "Soon after the battle of Gettysburg, the 7th Indiana Regiment was stationed near Waterford, Loudoun County. An acquaintance sprang up between Lt. Holmes of that regiment, and Miss Lizzie, daughter of John B. Dutton. The correspondence between the two, which ensued upon their separation, led to their betrothal. In an assault upon the Confederate works at Petersburg, the young Lieutenant was killed. A few days later came a letter from his betrothed. A friend and comrade of the slain officer, Joseph M. Dunlop, knowing the relation between the two, returned the letter, at the same time apprising Miss Dutton of the fall of her lover. A letter of thanks from the young lady for the mournful attention paid her, gave occasion for the interchange of several more epistles. Mr. Dunlop was deeply impressed with the style of the letters, having previously seen and admired the writer. The tide of war rolled on until the torn battle flags were furled at Appomattox. By the time the Eleventh Corps reached the village, in the late afternoon the citizens were no doubt weary of flag waving and cheering as little mention has been made of their passage through the town to their camps on the Hamilton road. Waterford had long waited for a chance to show its strong Union sentiments; they had at last cheered their heroes, now they would settle back to the almost daily routine of scouting parties and guerilla raids. Lt. Colonel E. V. White's Battalion formed the rear guard of Ewell's Corps, Army of Northern Virginia, on the retreat from Gettysburg until they crossed the Potomac. He then received permission from General Stuart to return to Loudoun County on a scouting expedition, With the Union army moving across the county, White was forced to remain in the Shenandoah Valley until they had passed on south. Upon reaching Loudoun on August 7th, White learned that two companies of the Sixth Michigan Cavalry, under Captain Vinton, had come from Harpers Ferry to Hillsboro, and then moved on to Waterford. He set up an ambush on the Wheatland road hoping to catch them on their return. In this he was fooled as Vinton went into camp on the high hill just south of town. White then moved his command into the woods bordering Catoctin Creek southwest of town. Shortly before midnight, the dismounted Confederates moved across the fields to attack the Michigan men in their camp. To reach the camp they were forced to cross a field in which there were a number of hay shocks; this caused the Southerners to become scattered. Colonel White advancing in front, holding his pistol ready to fire, accidentally fell over a shock discharging his weapon. Part of his men panicked at the shot and retreated, while others thought it the signal to attack and rushed at the encampment. Forewarned was forearmed, and the enemy poured a volley into the disorganized Confederates killing two men, one a company commander, and wounding several. Three men of the Sixth Michigan were wounded in the exchange of shots and a few horses were lost in the darkness, as both sides hastily withdrew. White's men captured three pickets on the Hamilton road. The Federals in precipitous £light reached Point of Rocks on the morning of the 8th, where the excited Captain Vinton reported the loss of fifty men: 11 actually he lost only seven or eight. The historian of White's Battalion says: "This affair at Waterford was fruitful only in disaster to our battalion." Despite the fact that Union sentiment was strong in the Waterford area, no physical harm had been suffered by its citizens at the hands of the Confederates. The Quakers had shown kindness to friend and foe alike, now two of their members were to become victims of the war because of their staunch loyalty to the Union. Two Southern sympathizers had been arrested by Federal authorities and confined at Fort Delaware. An order was issued to Colonel E. V. White for the arrest of three Quaker citizens of Waterford as hostages for the imprisoned Confederates: Asa Bond, operator of the prosperous tanyard, Robert I. Hollingsworth, school teacher, and William Williams, the town's most prominent citizen Were the ones selected for arrest. The four-man raiding party was led by red-haired Jim Mock, a stocky 22-year-old private in Elijah White's locally raised cavalry unit—and a former village resident. But by the time the squad reached Bond's house [40132 Bond Street], word of their mission had preceded them. They were met by Laura Bond, Asa's niece, and his daughter, Rachel Means, wife of their archenemy, Capt. Sam Means of the federal Loudoun Rangers, who lived next door. When the troopers of White's command came to arrest Asa Bond he was not at home. Bond's two daughters, upon hearing the purpose of their mission, opened a savage attack on the men with broomsticks and rolling pins. One daughter ran to the house next door and rang a large bell, next she got her revolver and fired two shots-with this the Confederates beat a hasty retreat, thus saving Mr. Bond a trip to a Richmond prison. Mrs. Means & Miss Bond stood in their door and dared the southerners to enter. They did enter. Slapped Mrs. Mean's jaws & Miss Bond fired [a revolver] on them ... If we [Rebels} had dared to do that with a Yank we would have been shot instantly. 1. Official Records: Series I, Vol. XXVII, Part I, Pages 263-297-299-325. 2. Harry M. Keiffer; Recollections of a Drummer Boy, Boston, 1889, pages 131, 134. 3. Orson Blair Curtis: History of the 24th Michigan of the Iron Brigade, Detroit, 1891; page 196, and Briscoe Goodhart: History of the Independent Loudoun Rangers:, Washington, D.C., 1896; page 102. 4. Letter of George Fowle, 39th Mass. Inf., now in possession of Mrs. Margery Greenleaf, New Haven, Conn.
7. Lt. David Holmes, 7th Ind. Regt., killed June 18, 1864 in the assault of the V Corps along the Petersburg & Norfolk Railroad. O.R.. Vol. XL, page 326 & 475. 8. Wilbur F. Hinman: Camp & Field, Sketches of Army Life, Cleveland, 1892; pages 422-23. 9. Official Records: Vol. XXVII, Part I, Page 710-733-746. 10. Now the property of Dr. W. T. Burch. 11. Official Records; Series I, Vol. XXIX, Part 1, page 67. 12. Frank Myers-"The Comainches", page 213. 14. William Williams, 1816-1892, was a minister at Fairfax Meeting, Society of Friends; merchant, president of the Mutual Fire Insurance Company which it still operating in Waterford today, and member of the town council. His home Was on the corner of Second and Janney Streets. It is now owned by Mrs. Festus Fotter.